I am often asked to describe the difference between a Total and an Annular Solar Eclipse. The key difference is that the Moon is further away from the Earth during an Annular as compared to a Total Eclipse. This gives the appearance of the Moon being smaller in the sky, and it no longer completely covers the Sun. Instead, a ‘ring of fire’ remains – the Sun still emits direct light. Even though the light is greatly reduced, it is still not possible to safely view with the naked eye. Filters must be used throughout. As a result, key features of the Total Solar Eclipse are missing. 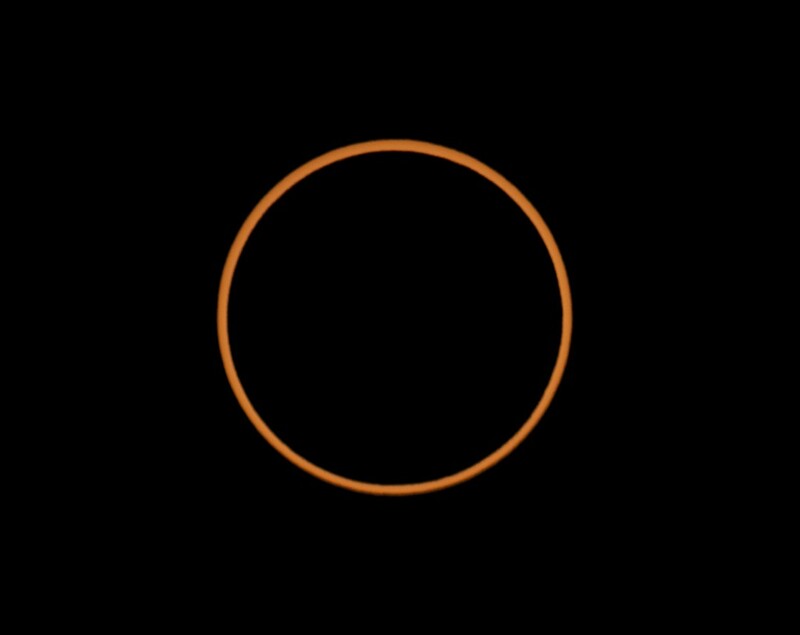 An Annular eclipse is pretty special, but if you are used to seeing a Total Eclipse then an Annular feels like a great buildup and then the peak just doesn’t happen. This is the reason why Geordie jokes that he “won’t get out of bed for anything less than a Total’ these days. What does it feel like to experience a partial eclipse, an Annular, and a Total? To me, it comes down to the degree of immersion and intensity. On a scale of 0 to 10 of immersion and intensity, a partial eclipse I would rate about a 4 – it is interesting, it makes you think about the Universe in a three dimensional way, it makes you feel insignificant, you become aware of the inevitability of the Universal clock. An Annular Eclipse I would rate about a 9 – there are added experiences such as the gradual dimming of light, animal reactions, the approaching darkness, and seeing the Ring. It is pretty awesome. On the same scale, I would rate a Total Solar Eclipse as – 100. This is because once you experience the Total Eclipse you realize that it is on a completely different scale altogether, and just cannot be compared. It completely blows you away. You have just received word that your favorite band in the world will be playing – and they are coming to your town! You queue up, feeling very excited when you purchase your tickets. Finally the day comes and you make your way to the venue. You find a spot that is close to the front, and it just so happens to give you a great line of sight of everything. The support band plays for an hour and you get caught up in the excitement, waving your arms in the air and dancing away as one with the crowd. The support band ends their set, and the crowd starts cheering excitedly, building up a crescendo of noise and screams until the moment arrives – your band comes on stage! You see them! You are beside yourself with excitement. For the next two hours, the band plays all of your favorite songs, and you feel like you are in your own little world, just you and the band, as you are part of this magical moment. You have the experience of a lifetime. You go home that evening feeling so incredibly lucky, and content with your life. Here’s the comparison – seeing a partial is like getting your tickets to the concert. An Annular Eclipse would be like seeing the support act and then going home. The Total is experiencing the whole thing. For those in Australia and the Pacific, enjoy the show on Friday 10 May. I will remain in bed for this Annular – but I will be watching live webcasts as it approaches midnight here in Belfast, wishing I were there.